Saturday was a perfect day in Berkeley: Sunny and 75. It couldn’t have been a better time for Color: A Fiber Festival. 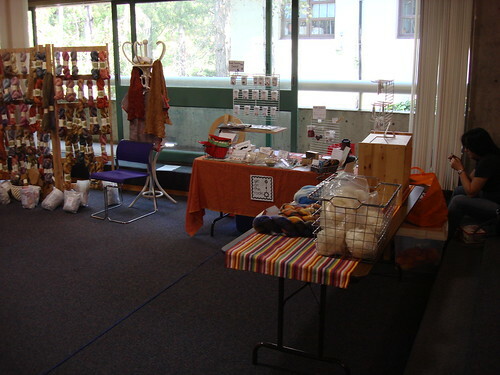 I was a vendor at this event together with A Verb for Keeping Warm, Tactile Fiber Arts, and Pigeonroof Studios. (But I couldn’t have done it without Abby and my table wouldn’t have looked the same without her tweed chickens, so thanks!). 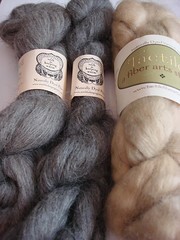 The Verb and Tactile ladies are fiber show pros, and they have a ton of product. In my typical style, I am less professional and little more garage sale-y, but I try my best. I still could not resist capturing some of their setup in action. I took a photo of my little table. I loved hanging out here and meeting other Ravelers and especially several of my blog readers. Hi Ladies – leave a comment!! 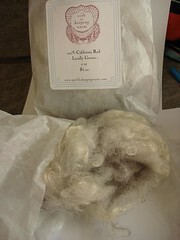 I was tickled every time I met someone that I recognized from their Ravelry avatar. The festival provided not only an opportunity to shop, but also several free classes. I taught two rounds of “Weaving on small hand looms” and was so happy that I had so many participants! A big high-five to everyone that was in my class! I hope you left with lots of ideas and that you aren’t all bidding against each other on ebay right now. And just because I was selling doesn’t mean I wasn’t buying…. I sure hope there are more Color: Events in the future. Seriously, it was SO much fun. Thanks so much Sara for your awesome organizational skills! I started a flickr Group so if you have photos on Flickr, send them over. 3 Responses to "Event Report – Color: A Fiber Festival"
It was so great to see you there! :o) and i love love love the STASH \\\’stache idea! Thanks for teaching us how to weave! This was a great event – I hope y’all do something like it again soon! Yay! It was a great time! I am so glad you and Abby were there. How did I get away without a set of your needle size tags? Maybe when I get my dpn organizer . . .